I read this article and found it very interesting, thought it might be something for you. 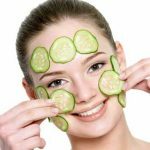 The article is called Cucumber, Mint & Egg White Face Mask To Reduce Wrinkles and is located at https://homemademasks.net/homemade-face-mask/egg-white/homemade-facial-mask-reduce-wrinkles-cucumber/. The juice of a fresh cucumber can refresh and sooth the skin, removes impurities, combats wrinkles, cellulite and soothes irritation. An interesting fact is that cucumbers have the same pH as your skin. The substances contained by cucumbers have a positive effect on the skin, stimulating the production of collagen which will make your skin firmer and more compact. Cucumbers are not only healthy tasty vegetables with a pleasant refreshing scent but are also extremely useful in combating various skin problems. Cucumbers are also great of helping fight dark circles around the eye area. These vegetables contain most of the vitamins you need in a day. One cucumber contains vitamins B1, B2, B3, B5, B6, folic acid, vitamin C, calcium, iron, magnesium, phosphorus, potassium and zinc. Cucumber has extraordinary, moisturizing, nourishing and astringent properties offering a multitude of benefits for the body. Mix well the cucumber with the mint in a blender. Beat the egg white until it becomes foam and add it over the paste of cucumber and mint. Apply the mask on your cleansed face and leave it to work for 20 minutes. For best results it should be repeated once a week.